Posted by Carl Glatzel Houston-based Art Director and Jazz Blogger. An unassuming mid-century bungalow in southwest Houston holds a jazz horde to be reckoned with. 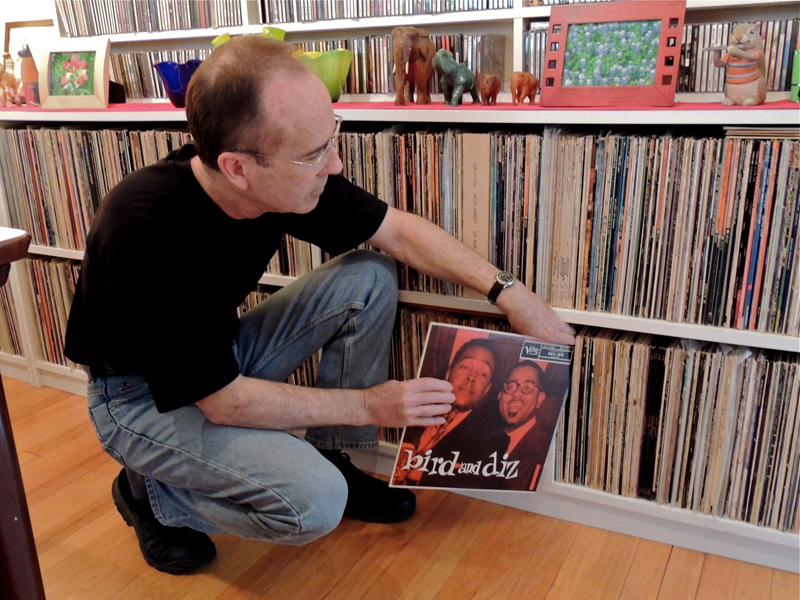 Local musician, photographer and jazz aficionado, Lindy Pollard, has turned his small but tasteful home into a living jazz museum. Some 5,000 titles grace his walls in custom-built shelving installed by the owner and his brother. Upon entering this treasure trove a visitor is oftentimes overwhelmed at the sheer volume. His collection spans decades as well as formats. Pollard will occasionally spin an LP but the bulk of his collection is of the compact disc variety. 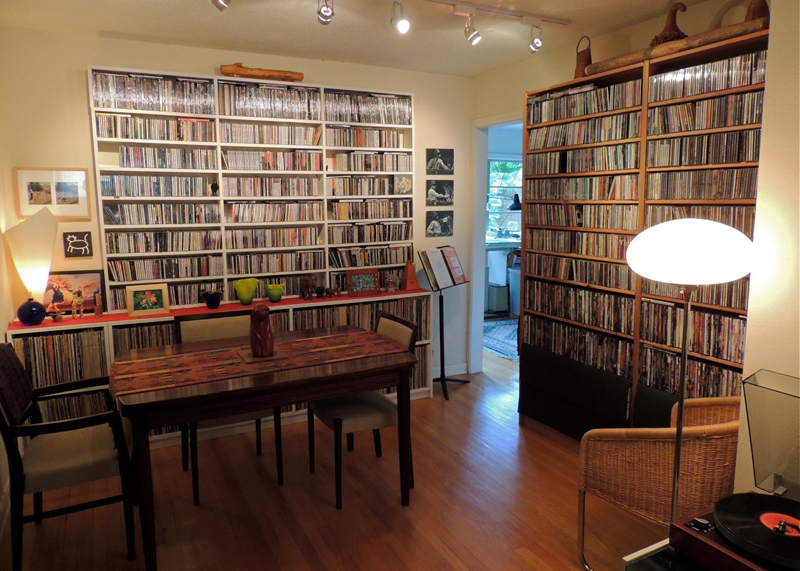 As neat and precise as the surroundings with its modern appointments, each album is arranged alphabetically by artist and is easily accessible. Pollard is quite literally ensconced in jazz whenever he sits to listen to one of his recordings or play with his cats. Seven-foot tall, vintage Klipsch speakers anchor his living room and offer a surround sound experience to be coveted by any audiophile. It’s safe to say this Houston native will never run out of things to listen to. His musical tastes run the gamut, from Brazilian jazz to vintage ECM releases to hard bop staples. Row upon row of out-of-print and rare releases sit waiting for an eager listener to happen by. Just standing amidst the volumes makes a jazzophile feel anxious. Having grown up in the 50s Pollard has held such virtuosos as Paul Desmond and Sonny Stitt in high regard. As we talked about the artists that fill his walls, he fondly remembers attending a Paul Desmond concert as a young sax student back in 1963. He recalls racing a classmate backstage to grab one of Desmond’s used reeds – one man’s treasure. His enthusiasm for jazz hasn’t wained one bit over the years. Having so many titles at his disposal helps to maintain a learning environment. 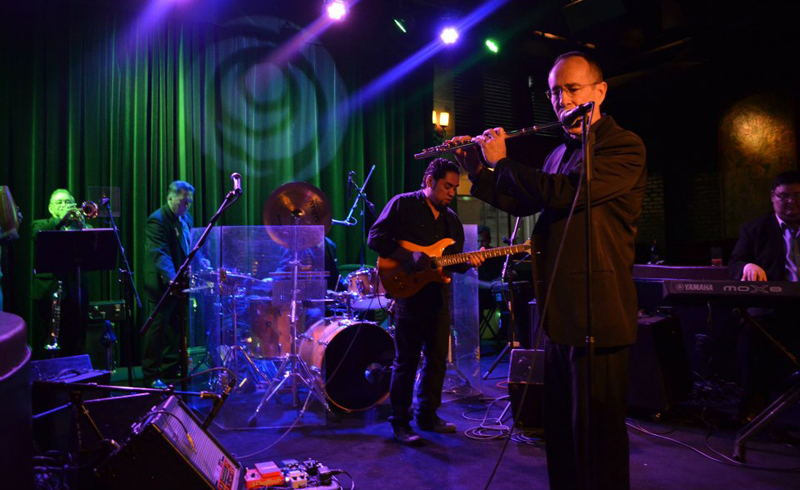 “There’s always something new on a recording you haven’t heard before,” Pollard points out. Aside from being a long-standing Bayou City multi-reedist Pollard is also an accomplished jazz photographer and graphic artist. Boasting several hundred originals, he has attended countless venues showcasing some of the most notable icons in the history of the genre. Many images catch artists in candid and even reflective poses. Artists such as Miles Davis, Chet Baker and Duke Ellington are only some of the mainstays you’ll see in his portfolio. His love for the artform is apparent in his attention to detail – each shot a special moment in jazz history. His photos have been exhibited at local galleries over the years to high acclaim. As of recent, Pollard has taken up nature photography as well. With trips to state parks, and even to his own backyard, he has begun to fill new photo albums with his boyish love of nature. Having visited this personal jazz vault several times over the years I never tire at slowly purusing the titles, wishing today’s circumstances would still allow me to do the same at local retail outlets. Those were the days. I’d like to write a digest of the *****-star article on Lindy Pollard. Could you send me his e-address? Should I attribute the item I’m writing to your blog and/or name of publication? Hi Fradley, my email address is lindy.p@earthlink.net. Thank you for your interest.